Send A Message To Terry. I am a Registered Psychologist operating a private practice based out of the Gulf Canada Square Building in the heart of downtown Calgary. I have had the privilege of working with adults, adolescents and couples for over 20 years now. I have a relational style and support individuals to identify and utilize their strengths to become more self-directing and resilient. Clients describe me as insightful, genuine and encouraging. I am a happily married father with two sons. I have an integrated and collaborative approach to therapy that is client-centered and directive. I employ a wide range of therapeutic techniques in order to meet each client's unique situation. I believe a critical part of our work together involves the establishment and maintenance of a safe and respectful therapeutic relationship. To achieve this I actively solicit client input and feedback regarding our sessions. In addition to providing counselling services, I am frequently asked to facilitate training sessions on a diverse range of subjects including: resiliency, effective change management, the psychology of happiness, 'True Colors' personality profiling, and work-life balance. Many of my clients come to me seeking a healthier work-life balance. Although far from perfect, I strive towards creating balance for myself spiritually, physically, socially and emotionally. 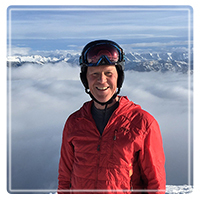 I make use of counselling support when I need an objective perspective and I recharge by spending time in the mountains on foot, bike and ski, hanging out with my wife and sons, meditating, dabbling in creative writing, listening to eclectic music and running along the Bow river. Life can be difficult and rewarding, sometimes both on the same day! I continue to be inspired by the courage with which individuals face challenges and strive toward a place of strength and well-being. I feel privileged to be able to share part of the journey with the people I meet with; to listen attentively, offer suggestions, and support them as they navigate through adversity. Together we also celebrate their successes. I remain encouraged by the indomitable human spirit and our ability with hard work and support to grieve our losses, learn and recover from hardship.